The Samsung C61R1AAMST will fit in with any counter-top seamlessly. Its radiant heating makes cooking easier and quicker, so you can enjoy what you want, whenever you want. Finished in black glass with a modern design, this built-in electric hob is a safe and stylish way to cook up a storm. The intelligent technology of this ceramic hob means that your pan’s base is quickly heated to a high temperature. As a result, you’ll be able to fry up faster than standard cookers without the worry of gas cooking. The four heated rings are designed to provide optimal and even heating performance. With the C61R1AAMST, you won’t have to guess when it’s cooled down. A residual heat indicator measures the heat of the radiant hob and lets you know when it’s cool enough to clean – when the ‘H’ symbol disappears. Even better, catalytic cleaning makes cleaning up after cooking quick and easy. This allows you to wipe away grease and grime with ease, leaving your hob spotless for next time. 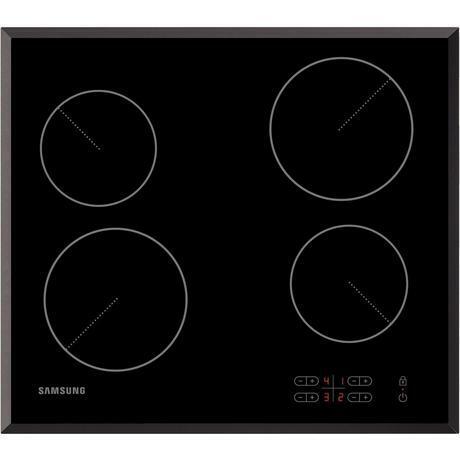 Take advantage of the touch controls on this Samsung hob, which let you cook with an incredible amount of precision. At just a flick of the finger, you can set and adjust the hob’s temperature. The in-built controls also allow you to clean the hob’s surface effortlessly, without having to work around awkwardly placed dials. Even better, you can put your mind at ease with the C61R1AAMST’s safety shut-off feature. This makes sure the hob turns off exactly when you need. The end result of all of this combined? An exceptional amount of comfort and control over your cooking experience. Rated ‘A’ for energy usage, the Samsung NV75K3340RS is an ideal addition to any home. 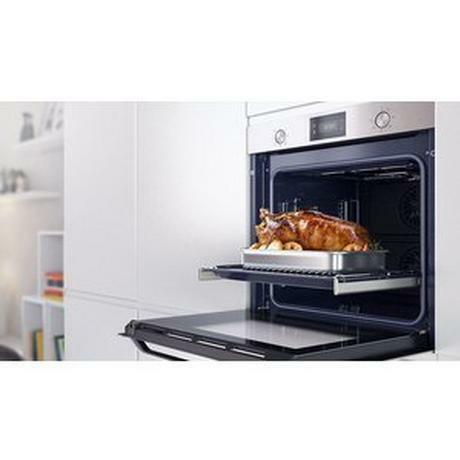 Discover new recipes and experiment with this superb electric single oven. Inside of the NV75K3340RS, you’ll find five shelves to move and adjust around your dishes. And, with a generous usable capacity of 75 litres, you’ll never struggle for space again. 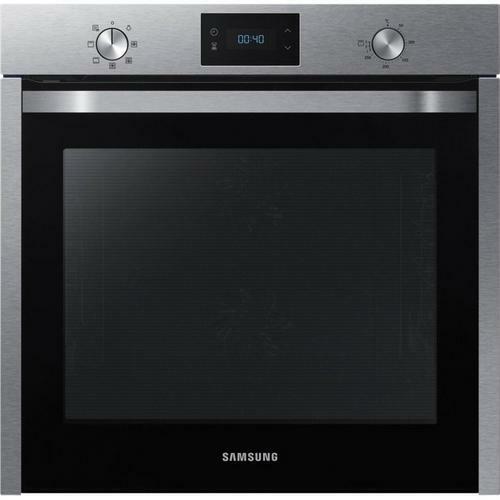 From hearty home-cooked meals to extravagant dinner parties, this Samsung fan oven is the ultimate appliance. From baking a batch of cookies to crisping up bacon, you’ll always be able to find the perfect setting with the fan oven and integral grill. 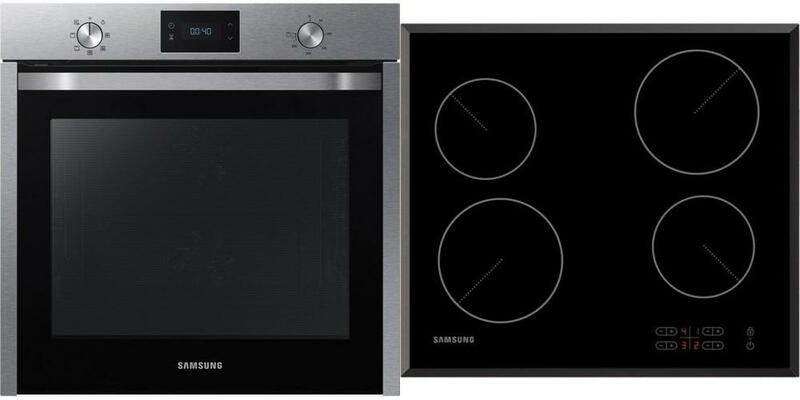 Samsung’s electric oven is even designed with easy-clean features. The catalytic lining absorbs any grease and residue while you’re cooking. The NV75K3340RS also features an enamel lining which makes wiping up easy and hassle-free. Tougher stains? Just remove the triple glazed door to get access to the oven interior. You’ll also love Samsung’s innovative dual fan design. Spinning in opposite directions, the two fans spread heat evenly throughout the oven. This means the oven will reach your desired temperature at a faster rate, so your creations will be ready in no time at all. With retractable dials and a digital LED display, the NV75K3340RS couldn’t be simpler to use. You’ll also be able to keep an eye on your masterpieces with the handy bulb light. Plus, thanks to the programmable timer, you’ll never forget about another dish again. Whether you’re cooking for one or the whole family, the telescopic rail makes moving dishes in and out of the oven a breeze. You’ll also get a tray and wire rack included to help you get cooking straight away.